After so many days wandering the back roads of Oregon, searching for bridges, we decided to spend our last day out taking things easy. One lovely bridge was on our agenda for the morning after a great rainy day breakfast at “The Gathering Spot” . On the menu were crepes with Black Forest Ham and swiss with arugula, and home fries with fresh baked pastries. I even had a perfect cappuccino with floral designs in the foam in a big ceramic cup. Before traveling north the short distance from Silverton to the bridge, we walked around town a little bit, checking out the antique stores and a few other shops. I still don’t quite understand why there are always antique stores in these little towns. Is it a low overhead to run an “antique” store? Most of the stuff was certainly less than antique…more like oldish and used. Gallon House Covered Bridge was one of the older bridges we saw on this trip, built in 1916. We now recognized the old Howe trusses, and noticed that the portal was large and square, an indication that it had been redone to accommodate bigger logging rigs over the years. The roof was especially lovely, fresh with new lumber from a recent restoration. Back to the park for a relaxing afternoon in the rain with books and movies felt wonderful after all the running around we had been doing. Silver Spur RV Park was a good place to be on a rainy day. The park was only about 1/3 full, with the majority of rigs grouped along the upper boundary near the fishing pond. The lower area with huge pull-through sites was nearly empty. We found out later that the upper sites are for longer stays with metered electricity. In spite of the cloudy skies, the rain came and went and made everything look so fresh and clean. The next morning we planned a visit to the beautiful Wooden Shoe Tulip Farm, right on the way via the back roads from Silverton to Mo’s brother’s place in Beaver Creek. Our trip was coming to a close, with a night at Dan’s spent visiting family and picking up the log splitter that Mo had taken there previously to benefit from Dan’s amazing welding expertise. We were treated to the most amazing display of tulips I have ever seen at the farm. Even though the “official” dates for the Woodburn Tulip Festival ended last weekend, the fields and store were still open for a few more days before closing up shop until fall for the Pumpkin Festival. Most of the huge fields of early tulips were long finished, but the display of late tulips still in bloom were breathtaking. Mo especially enjoyed the old wood burning steam powered tractors. After spending a relaxing night at Dan’s, we put on our traveling shoes and headed straight home down I-5 and 140 over the pass to Rocky Point. Using the power of the MoHo to pull the trailer loaded up with the splitter, I followed along in the Tracker. Not a speck of ambling, even though we knew there were bridges waiting for us near Myrtle Creek and other points south that we hadn’t yet explored. Another time. We were like horses going to the barn, ready to get back to Rocky Point to see if our very own tulips had opened. Sure enough, all was well, and we didn’t miss that ephemeral moment of tulips in full bloom. This is the last time I am going to post this paragraph! Just in case you haven’t seen it already. Clicking on the linked bridge names will take you to Bridgehunter.com with historical information about each bridge, location maps and photos. Hovering with your mouse over the photos will give you the name of the bridge as well. Again, the google map and link to our tour is here. My picasaweb/google photo albums have many additional photos of the bridges and our trip. As someone noted in a recent comment, the Benton Oaks RV Park was a fairly pricey stay. Although expensive, we wanted a location central to the western area bridges and the fairgrounds were the cheapest deal around. We really weren’t up for boondocking in cold rain in the forest, and were glad at least for electricity to power the little electric heater we have for cold nights. It is so much nicer and quieter than the big noisy furnace. Corvallis is the home of Oregon State University (the black and orange colors for the Beavers are sooo much prettier than that yellow and green Duck thing (University of Oregon). Just thought I might mention that for a couple of my more regular readers. :) Very important that folks don’t mix up OSU and O. It also has a beautiful quilt store, and of course I had to check it out. Again I was thrilled at the incredible variety of fabrics and styles and came away with another pile of amazing gorgeous fabric. Who knows when I will ever get a chance to actually quilt it, but my newbie stash is growing exponentially. After our two day stay in the somewhat funky expensive campground, we decided to head for Silverton and the fairly new Silver Spur RV Park, one of the few parks in the area that honors our Passport America discount. Being the middle of the week, we didn’t worry about a reservation and simply knew that after a long day of bridge hunting, we had a nice park to go to with all the amenities we might need for half the price of what we paid to stay in Corvallis. There are six bridges not far east of the interstate north of Albany and south of Salem. I had some difficulty trying to map out a route that didn’t include a bit of backtracking, so we just let it be and backtracked as needed. Our first bridge of the day was the Hoffman Bridge near Crabtree, (pictured in the first collage above). Not far from Crabtree, this bridge is on a main route to the highway, and with its asphalt decking seemed to be pretty popular with bikers. Instead of worrying about dogs this time I had to be careful to stay out of the way of the bikers when I was taking photos. The route to the Larwood Covered Bridge (above) was a bit less straightforward. We had dropped the MoHo off at a wide spot in the road just before the Crabtree bridge (which was a good thing since it only had a 10.5 foot clearance!) and picked it up before traveling east to find Larwood and the Roaring River. I was driving the MoHo and Mo was following in the baby car as we attempted to find a place to turn around. In the entire six miles from the highway to the Larwood bridge there wasn’t a single turnout, wide place, or even a road to turn around at all. Instead, we drove all the way with both rigs, and thankfully there was parking on the far side of the Larwood Bridge at the most lovely little park I have seen in a long time. We stayed there a long time, enjoying the river, the park, and the beautiful setting of this lovely open bridge. The GPS wasn’t much help, but I had cell service and was able to navigate back to the highway and the town of Scio without having to turn around. Wandering the back roads of Linn County gave us a chance to see some lovely farms and fields, freshened by the spring rains. Back to the town of Scio, we once again left the MoHo parked in town and drove the few miles to the Gilkey Covered Bridge (above) about 3 miles back west along Goar Road. The countryside was lovely, and Gilkey was another bridge with open sides showing off the weathered trusses. In addition, the roof rafters were still visible and quite lovely. More bikers were using this country road as well and enjoying the asphalt paving. Of course, after seeing so many bridges with wooden pavers, we didn’t appreciate the asphalt as much as the bikers did. Returning to Scio, we passed the MoHo parked safely along a side street, and drove 6.5 miles back east toward the Hannah Covered Bridge (above). Another open sided bridge with visible trusses and an asphalt deck near an open road, the redeeming quality of Hannah was its beautiful setting on Thomas Creek. In all our circling around, we had actually passed the Shimanek Covered Bridge (above) twice, seeing it from the main road and decided that we would visit it last. Just a few hundred yards north of the highway, this little red bridge somehow only seemed “OK” to us. Easily found, with asphalt sporting a yellow line down the middle, and fresh red paint, I only took one photo of this little bridge. The traffic was coming and going and there was no place to stand with a camera that felt very safe. For our last bridge of the day we drove north of Scio to the town of Stayton. I had never been to Stayton before and was surprised to discover a delightful, clean, charming little town tucked away amid green fields and open roads. The lovely Stayton-Jordan bridge (photo above and collage below) is housed in the city park and has a great story. It was built, lost, saved, moved, rebuilt, lost again, and then finally rebuilt again. “Prior to 1986, the Jordan Bridge spanned Thomas Creek in neighboring Linn County several miles east of Scio. The original bridge location had once been the site for a dam, a cheese factory, two mills and a general store. Are you getting tired of this paragraph yet? Ha! I still have two more groups of bridges to write about! What a wonderful night we spent at River Bend! Everything was incredibly quiet until the storm came and the skies clouded up. We took our time getting on the road since it was a bit of a gloomy morning and the MoHo was all cozy and comfy. Traveling west on US20 toward Lebanon was uneventful and we continued on US34 across the interstate toward Corvallis. We chose the Benton Oaks RV Park at the Benton County Fairgrounds as our resting place for another two days of bridge hunting. When we arrived, the park manager was off site, but quickly answered his phone with instructions for choosing a site. We managed to get settled in just before the heavy rains started up again. Benton Oaks is an adequate park, but for a county fairgrounds park, certainly not cheap at $34 per night. That included full hookups, WiFi which was surprisingly good when it worked, and cable tv which had about 20 channels. I gave up on the WiFi and hooked up my Verizon MiFi instead and we watched local news to catch up on what had been going on in the world during our several days without TV. Not much! Somehow, with the storms and pouring rain, I completely forgot to take any photos of this park. With a long afternoon ahead, we decided to travel west to the little town of Wren and the Harris Covered Bridge (above). We drove west along US20 through the little town of Philomath and down a back roadway to the bridge. Once again we were very happy to be in the Tracker, since the road was narrow and the bridge small, even with its 27 ton load limit. As we have discovered, often there is some kind of home or dwelling near the bridges, and this time it was the Harris Bridge Winery. I have learned to watch for dogs and people when I get out of the car to check out the bridges! Returning to Corvallis, I discovered to my delight that the Irish Bend Covered Bridge (above) was just half a mile from our campground on the Oregon State University Campus. With the winds blowing and huge black storm clouds threatening, we decided to walk the campus trail before the weather turned any worse. It was so beautiful, and the sun came and went at perfect moments and the rain once again held off until we were back home. I tend to get a bit low when it is gloomy, but somehow the rainy skies that greeted us on our second morning in Corvallis didn’t trouble me at all. The nice thing about these spring rains is that there are shifts and changes in the light, the sun comes and goes, the rains dump for awhile and then everything is brilliantly green and backlit. Still, when I woke up to another rainy day, I was really happy that we had the bridge hunt to keep us occupied. If we had planned a lot of hiking, biking, and kayaking on this trip as we usually do, we might have been disappointed! We traveled west along US34 toward Alcea to see the Hayden Covered Bridge. As usual, there was a farmhouse nearby and a beautiful old barn silhouetted against the dark skies. We were even treated to a large herd of elk grazing near the river. We then found the forest road that led to the Fisher School Bridge, several miles along a narrow but paved route that let to one of the sweetest little bridges around. The fresh red paint and the obvious love that went into the restoration of the remote little bridge was endearing. Leaving the Fisher Bridge, we thought perhaps we could find our way to the coast over the mountains to the North Fork Yachats Bridge, but after several unfruitful attempts to find the road (even with the GPS) we gave up and drove back north to Highway 34. It was only another 20 miles or so to Waldport and then just another few miles to Yachats, so once more we decided we could cheat a little bit and go back to our beloved Oregon Coast. Even on this rainy day, after being away for a few days, the ocean looked incredible. I t was getting a bit toward mid-afternoon, and the leftover quesadillas were a bit cold though adequate for a traveling lunch. Then again, we WERE on the coast, and what is best on the coast? Clam chowder of course. As we crossed the bridge into Newport we decided that a bit of chowder at the original Mo’s would be a perfect afternoon treat. Now I heard someone, a blogger or two, recently unhappy with Mo’s chowder, maybe Laurie? Of course, Laurie is a true foodie, with exquisite taste, but I still love Mo’s and on this cold rainy day, it didn’t disappoint in the least. The chowder was potato-ey, and creamy but not too much so, perfectly seasoned, and loaded with lots of tender juicy pink clams. For dessert I succumbed to the famous Mo’s marionberry cobbler. Ahhhh. Not gooey or sticky, just perfectly sweet fat huge marionberries and tender cobbler crust. Topped off with a great cup of coffee, we were ready for the last bridge of the day. Back on the road, we traveled the familiar route along 101 from Yachats to Newport and again headed east toward Corvallis on US20. The Chitwood Covered Bridge is just off the highway spanning the Yaquina River about 20 miles east of the coast. It is one of those bridges that actually has a street view on google. It was a pretty red bridge, but with its accessible location and utter visibility there wasn’t a great deal of excitement when we found it. Do you suppose it was because it was the end of a long rainy day? We were happy to roll into the fairgrounds in time for a bit of relaxation with our 20 meager channels of television before getting ready to roll to a new campground the next morning. We planned our next day of bridge hunting from Eugene with the thought of a lovely morning walk along the trail before traveling east and north toward Cascadia. We also had to make a decision to give up traveling to some wonderful bridges east on the MacKenzie Highway and save those for another time. Too many bridges! Although we had heard rumors of the Eugene Marathon, we didn’t quite understand that all those folks would be running right past our little mall campsite on the same trail. After a bit of Indecision as to how to best manage a walk amidst weary runners approaching their 18th mile we finally decided to cross the bridge, thinking we would be far ahead of the pack. Once there, however, we discovered we were at the 24th mile and the front of the pack was already coming on strong behind us. It was another beautiful morning, with the early fog and clouds lifting to bright sunshine, but still cool enough that the marathoners had perfect running weather. The excitement was even a bit contagious, as we walked along, staying out of the way of the runners, and listening to all the cheers of encouragement. I used to love to run, but I can’t imagine doing a marathon. We gassed up at the Eugene Costco and headed north toward the town of Mercola and two more bridges that are within a short distance of each other. Even with coordinates and written directions, the Wendling Covered Bridge wasn’t easy to find. We were also towing the Tracker and were a bit concerned about just whether or not the road would have a turnaround if the bridge wasn’t crossable. We were lucky, and there was a wide area to park and actually turn around. Just a few miles back toward Mercola, we found the Earnest Covered Bridge right on the main road and even drove through it. I have to say that by this time, I was losing track of where we were going and what we had seen. There may have been an easier way to do this, but I never figured it out. We just wandered and ambled around, at times backtracking a bit here and there. We ambled north toward the little town of Crawfordsville, where the Crawfordsville Covered Bridge was in full view right along the main highway. No problem, just turn left here…and park here… and, well….now how to get back to the highway? After walking across the lovely bridge and enjoying the beautiful creek and flowering trees we jumped back into the MoHo and thought, well, maybe this road goes around and comes back out in Crawfordsville. We kept going, and going, and after a few miles of very steep ups and downs on a very narrow road, we came to a small turn around area. Mo just laughed and said, “think of it as an adventure”. It was easier to do that once we were actually able to turn around! Finding out next bridge was a piece of cake, and the parking was easy as well. The Weddle Covered Bridge in Sweet Home is right downtown in the city park. The bridge spanned Thomas Creek for more than 50 years, but was bypassed and neglected. “The deteriorated bridge eventually became a safety issue, and the span was scheduled to be demolished. This action sparked protests by local covered bridge enthusiasts. As the story goes, one person chained himself to a bulldozer to prevent the bridge’s demise. The air was warm and the sunshine gorgeous and we lingered awhile, just appreciating the lovely site. We checked out the small Dahlenburg Covered Bridge in the park as well, built by the Sweet Home High School Building Trades class of 1989, as a class/community project. The completed 20 foot bridge allowed access from the school to Sankey Park, crossing Ames Creek. Our original plans for the day were a bit ambitious, and with the afternoon waning Mo and I decided that we would simply go to Cascadia and then perhaps drive back to an RV park that we located in Lebanon, not too many miles back west. On the way to Cascadia, we passed the Foster Reservoir and Green Peter Reservoir on the Santiam River. Linn County has some very nice parks with lovely campgrounds. 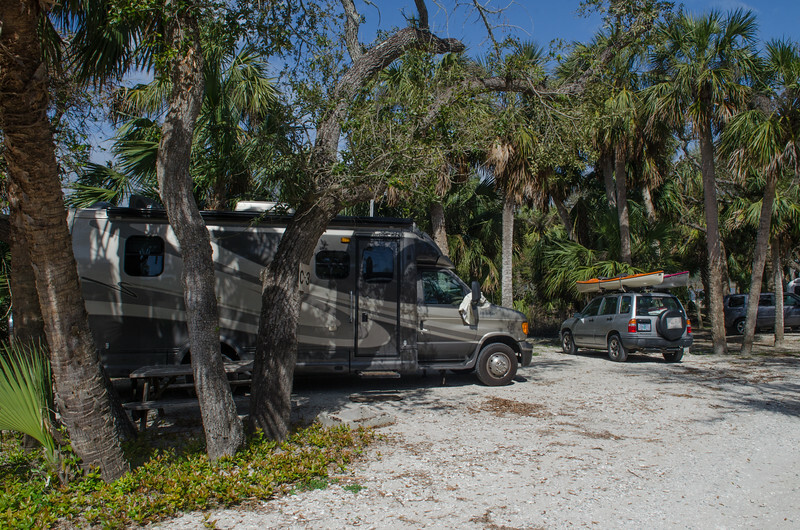 We explored the main campground and decided that it would be a nice place to stay sometime with good access to wonderful little inlets for the kayaks. However, on this beautiful Sunday afternoon we were both just too bushed to pop those kayaks into the water and instead drove on east toward Cascadia for the last bridge of the day. The Short Covered Bridge was worth the drive, and with its open sidewalls and the beautiful Santiam River, I added it to my list of favorites. We were a bit tired of worrying about turning around so unhooked the Tracker in Sweet Home and left the MoHo there in a parking lot. Interestingly, there were few lots where we could park easily, even at the grocery store, and the few empty lots had some very large No PARKING signs with threats of vehicles being towed away if not authorized. Finally we found a wide place in the road near the Safeway parking lot where we felt safe leaving the rig for a short time at least. Once at the bridge, we enjoyed the open sides, the river, the beautiful roof timbers and the Howe Trusses before walking to the other side. Immediately we were greeted by a chorus of howls and barks and discovered that just across the street was a wolf breeder. Signs warned of the wolves in addition to advertizing the sale of wolf pups, but the howling made me wonder what it must be like to live next door to that guy! On the way back to pick up the MoHo, we scrapped our plan to drive to Lebanon in favor of the lovely and very nearly empty River Bend Campground, along the Santiam River between Sweet Home and Cascadia, another Linn County Park. The price for seniors was $19. with electric and water and a dump station, the pads were the most level asphalt I think we have seen and the patio was clean, no mud anywhere cement. After parking in the mall parking lot, the quiet sound of the river below us and the wind in the trees was perfect. One of the finest parts of camping for free at the Eugene mall is access to the beautiful Ruth Bascom Riverbank Path System along the Willamette River. We woke in the morning before daylight to the sound of footfalls beside us along the pathway. Eugene folks are by and large a fit, healthy bunch, with running, exercise, and healthy food a big part of the culture. Maybe it was just that we were on the running route, but I haven’t seen so many svelte people in a long time. We decided to cross the bridge near the MoHo to the West Bank Path for the two mile walk to the next bridge across the river and returned two miles on the East Bank Path. Eugene was cool and misty that morning, but the leaves on the huge cottonwoods had popped and everything was that bright neon backlit green even with gloomy skies. By the time we got on the road for our day of explorations, the sun was out most of the time with beautiful blue skies to enhance the scenery. Our first planned bridge was in the tiny town of Drain, at the furthest southern extent of what we wanted to see. There are many bridges near Myrtle Creek and farther south, but we decided that we could visit those another time from home. The easy route would have been the interstate, but who wants that?! We chose instead to return to Territorial Highway and follow the back roads all the way to Drain. The most beautiful valley opened up in front of us, filled with farms and orchards and beautiful vineyards. On the western skyline we saw what looked like some sort of castle, and turned out to be the Kings Estate Vineyards, rivaling anything we have seen in the wine country of California. I wished that I had put on something other than comfy sweats since the place was a bit intimidating. We drove around but declined to treat the proprietors to our sweatshirty presence. Entering the little town of Drain was a treat. So many times I have passed the “Drain” exit on the freeway and wondered why a town would be named Drain. I still have no idea why, but do know a bit more of the history and that it is a delightful little place, with everything you could need; post office, grocery store, fabric store, hardware store, gas station, and a beautiful community center, library and city park. Housing around 1,000 folks for the past 50 years or so and 500 for the previous 50 years, the town is small but surprisingly stable. The park was beautiful, with the Pass Creek bridge dismantled from its original location and restored and relocated in the idyllic park. The setting was lovely, and quite different from what we had seen previously. the only remaining covered railroad bridge in the state of Oregon. It has been beautifully restored and is no longer in use except for pedestrians. The ironwork image of a big steam engine along the northern wall was an interesting touch. There are several interpretive signs with the history of Cottage Grove, the importance of the railroad there and stories of life in Cottage Grove when it was a town completely focused on timber. Traveling east from Cottage Grove toward the Dorena Reservoir along Mosby Creek Road, we found another five bridges. Each unique in its own way, and each with a story. Stewart Dorena Currin These bridges are within a few miles of each other and once again we traveled roads we might have never seen otherwise through rural parts of Oregon just off the main highways. Currin was a favorite with its red sidewalls, and the red glow from the high interior windows. We drove back north toward Highway 58 and traveled the short distance east toward Lowell. Just south of Dexter, a few miles down a back road was the Parvin covered bridge. Back again on the main highway, the familiar site of the Lowell covered bridge greeted us as we drove along the southern shore of Dexter reservoir. Highway 58 is one of my major driving routes from Klamath Falls to Portland, but I have never actually stopped at the Lowell bridge. This bridge is big and beautiful, with lovely windows and an especially informative and well done visitor center as part of the bridge and the parking area. The interior signboards are illuminated from within so they are easy to enjoy inside the dim light of the bridge. From Lowell we drove north to the tiny town of Unity , and the Unity covered bridge. This little bridge was a favorite, small but perfect. Driving back west on the back road to Jasper, we found the last bridge of the day, the Pengra covered bridge. As I am writing this, I am feeling a bit the same that I did on the day we actually traveled this route. The bridges are all running together and I am getting confused again as to which is which! I am so glad that I have the photos to remind me of the special features of each one. Ten bridges in a day is a lot, even when they are are as closely spaced as this group. We were happy to get back to the MoHo tucked away along the river at the mall and enjoy a relaxing evening.